We approach every interaction we encounter with the belief that people should be better off having met us. Therefore, we strongly believe in serving our community. From financial support to causes that line up with our personal convictions, to local outreach efforts, to indirect involvement in global projects, BRS Financial Group is committed to improving the world in which we live. Committed to helping those in need Commonwealth’s commitment to service does not end with its advisors and their clients. For more than three decades, the firm has been dedicated to serving the communities where its employees and affiliated advisors work, live, and visit. Commonwealth Cares, a 501(c)(3) charity, was formed in 2010 to maximize the impact of those efforts. The foundation’s mission is to provide contributions of time, talent, and financial support to a wide range of philanthropic efforts aimed at relieving human suffering, promoting social and economic growth, and sustaining and protecting our planet’s resources. That kind of dedication to the greater good is just one more reason we’re proud to be affiliated with Commonwealth. If you'd like to know more We'd be glad to talk with you further or answer any questions you may have about our affiliation with Commonwealth. Please feel free to give us a call. Commonwealth's commitment to service does not end with its advisors and their clients. Commonwealth Cares, a 501(c)(3) charity, was formed in 2010 to maximize the impact of those efforts. The foundation's mission is to provide contributions of time, talent, and financial support to a wide range of philanthropic efforts aimed at relieving human suffering, promoting social and economic growth, and sustaining and protecting our planet's resources. We are committed to giving back to the community that has given us so much. As part of these efforts, we are proud of our affiliation with Commonwealth Financial Network®. In 2009, Commonwealth created Chemo Caps for Kids to provide hand-knit and hand-crocheted hats for children undergoing cancer treatment. Since then, Chemo Caps for Kids has donated more than 3,000 hats to children’s hospitals. This is just one of the many philanthropic efforts that make us proud to be affiliated with Commonwealth. In December, our team got up bright and early one morning to head to Children's Hospital Central California to prepare breakfast for the families staying at the Ronald McDonald House. We prepared all of the fixings for breakfast burritos and served the families from 7 a.m. to 9:30 a.m. that morning. 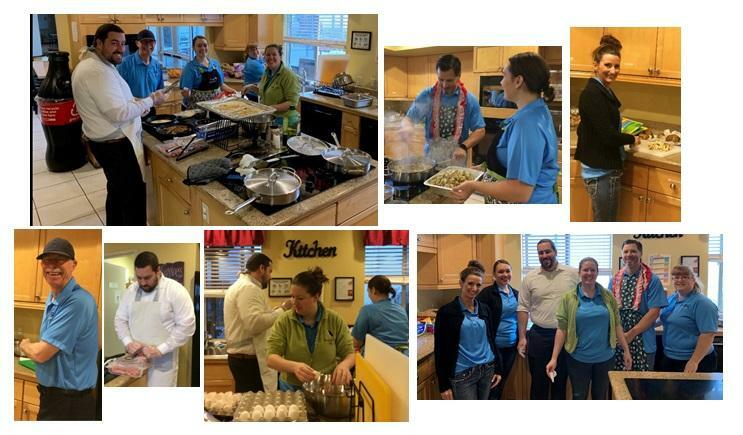 It was a great time in the kitchen as a team, especially knowing we were doing something for families who are going through a hard time with one of their littles in the hospital.